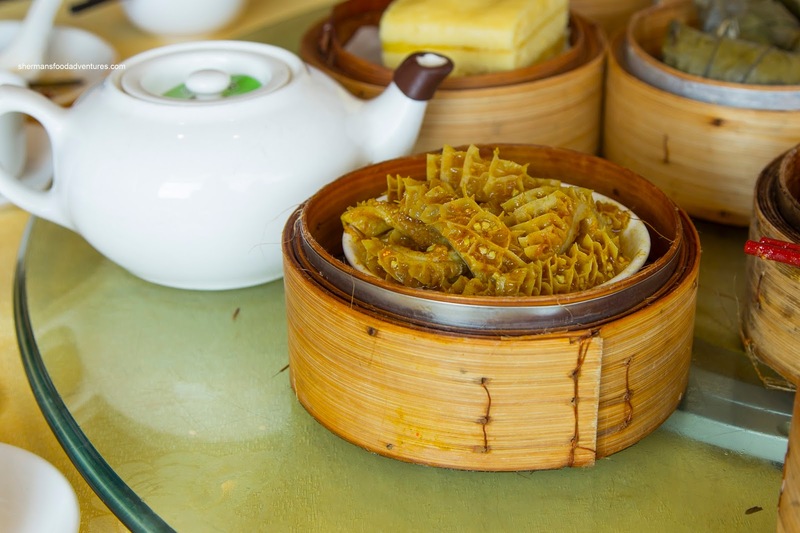 I don't even know why my parents ask me where I would like to go for Dim Sum all the time... Generally, anything I suggest is shot down with fervour and we end up going to a spot that they like. Then why ask me? It's like another form of a dictatorship during an election - there is only one choice on the ballot! If you decide to deviate from the norm, you will either be shot or sent to a work camp. So this time around, I just didn't even bother suggesting a spot and deferred to my mom. We ended up at one of their favs being Fraser Court. Since we arrived fairly early, there was a 20% discount to be had if we settled the bill prior to 11:00am. Suffice to say, we ordered pretty quickly and paid shortly afterwards. 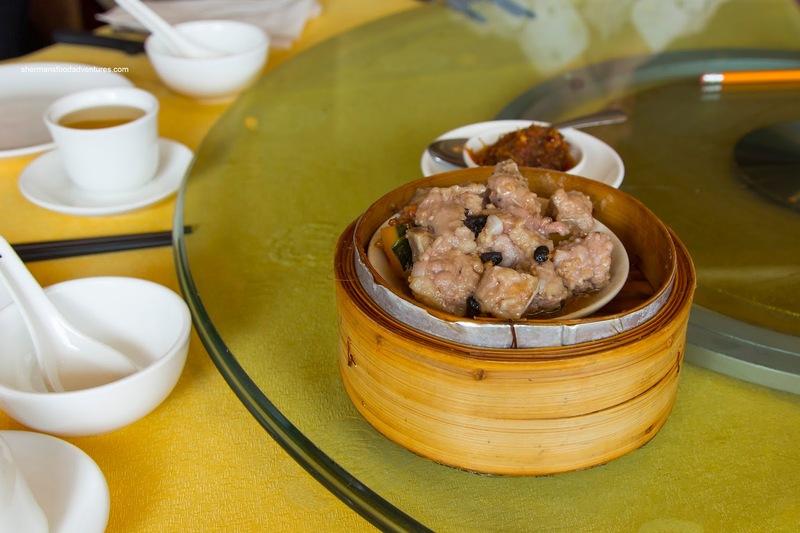 Everything arrived at once, so I was able to get all my pictures in quickly beginning with the Steamed Blackbean Spareribs. These featured the meaty rib pieces and I didn't even noticed much in the way of cartilage or fat. Texturally, there was the desirable chew to go with the meatiness of the ribs. There was plenty of garlic and salty hits in every bite. 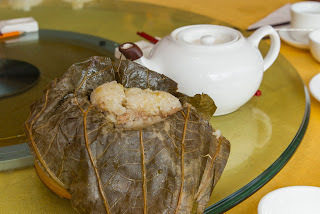 We decided to try the Lo Mei Gai (Sticky Rice) next and they were pretty good. The rice was chewy and a touch dry. However, the equal amount of ground pork filling alleviated the problem. I found the flavours to be rather mild though. 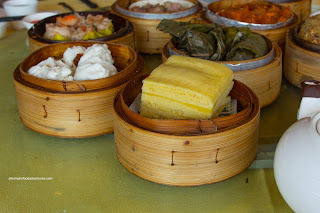 Onto the staples of Dim Sum, the Haw Gow sported a causality. One of the dumplings had an unattractive puncture on one side. However, that didn't really diminish the eating experience. 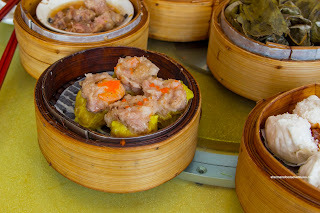 I found the dumpling skin to be chewy with a moderate thickness. 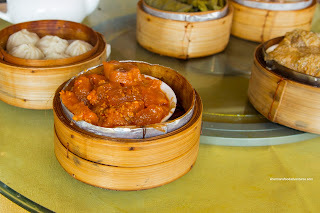 It was steamed just enough that it was not wet. Inside, the combination of whole shrimp and shrimp mousse was noticeably "shrimpy" tasting (and well-seasoned too). There was mild meaty snap to go with the airy mousse. 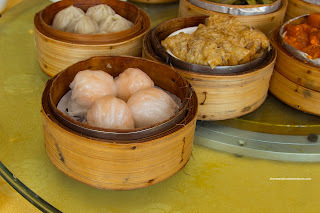 The Siu Mai (Pork & Shrimp Dumpling) featured the natural meatiness of pork combined with the snap of the whole shrimp. Again, the "shrimpiness" came through as well as a background sweetness. The dumpling could've used more shiitake mushrooms though. For the offal course of our meal, we had both the Curry Honeycomb Tripe and Beef Tendon. The first order of tripe had a hair in it, so we sent it back. Not sure if they merely removed the hair or we got a new order (we hope it was the latter). There was minimal gaminess, yet the strong curry flavour and spiciness would've masked that anyways. I found the texture to be on the softer side with very like rebound. As for the beef tendon, it was a bit too soft for my liking, however, it wasn't as if the pieces had melted either. There was a significant garlickiness to the dish as well as plenty of spice from the chili flakes. 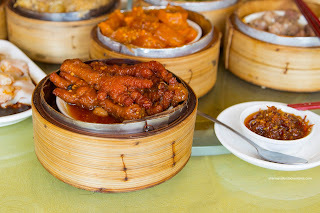 Also sporting chili flakes, the Phoenix Talons (Chicken Feet) were surprisingly spicy. We normally find this dish to be sweet and mild-tasting. I actually liked this version as it added some punch to go along with the ample amount of garlic. The chicken feet were not very plump though as the skin was rather tight to the bone. Hence, there wasn't a whole lot to eat (there isn't much to begin with anyways). 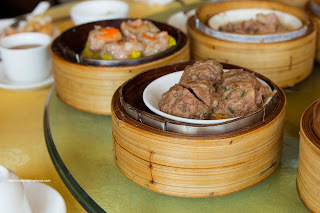 Much like the other items we had so far, the Beef Meatballs were smallish in size. They were on the firmer side with a meatier rebound. Flavourwise, they were good on their own (without the need for Worcestershire) being well-seasoned and featuring an appealing amount of dried orange peel. Also on the firmer side, the ground pork filling in the Bean Curd Skin Roll was meaty rather than having a bouncy texture. It was bordering on dry, but the mild-tasting sauce helped that issue. I found the fried bean curd skin to be nicely chewy while moisturized by the "just right amount" of sauce. I liked how there was woodear mushrooms and bamboo shoots, which added texture and flavour. 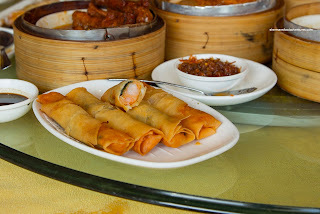 Onto a different kind of roll, the Shrimp Rice Noodle Roll was a bit thick, yet at the same time was buttery soft. I would've liked to see more elasticity, but it was okay. 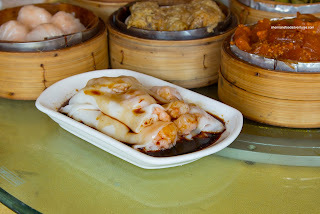 Inside, the whole shrimp (albeit smallish) filling was meaty with only a slight snap. 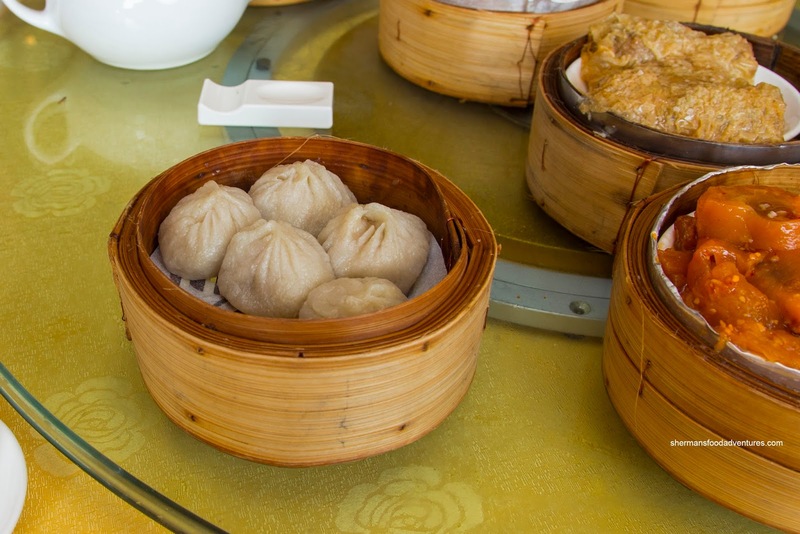 Usually, ordering Xiao Long Bao at a Cantonese Dim Sum service is as smart as jaywalking in Richmond. However, these were decent if we didn't think of them as XLBs. There was actually some soup (which was a bit sweet) to be found while the meat was moist and tender. 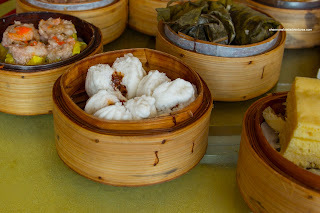 As expected, the dumpling skin was rather thick and doughy. 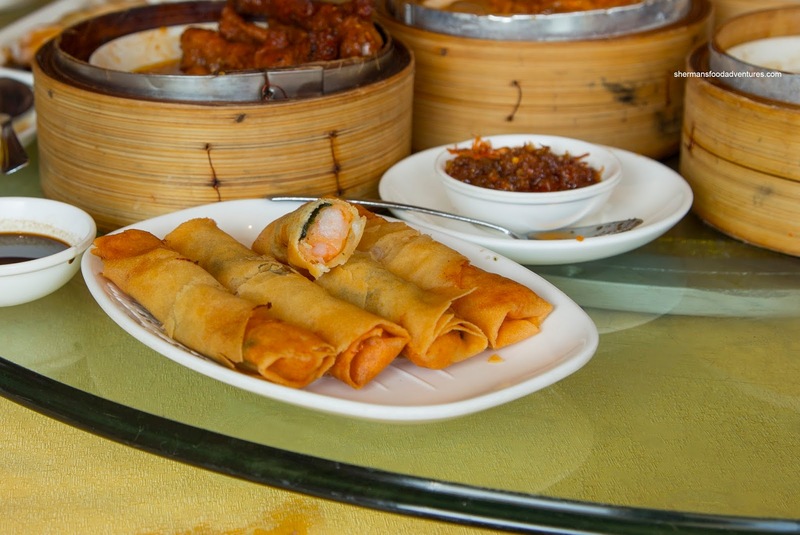 Whenever we go for Dim Sum, my son eagerly awaits for the Shrimp Spring Rolls. However, these inexplicably showed up almost last, which was an excruciating amount of time for him. Interestingly, he happily ate them despite the inclusion of seaweed. Apparently he eats seaweed now? Anyways, these were not as crunchy as we would've liked while the filling was similar to the one found in the rice noodle roll. Another dish for the kiddies were the BBQ Pork Buns filled with predominantly with lean pork intermittently interrupted by little bits of fat. This was all glazed with a sweet sauce that could've used a bit more savouriness. As for the bun itself, it was firmly fluffy where I would've liked to see less density. For dessert, we had the Steamed Sponge Cake. This was also firmly fluffy, but still airy enough. It was rather sweet though from the layers of custard. 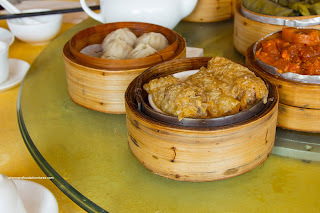 Overall, we found the Dim Sum to be above average at Fraser Court. Coupled with the early discount, the total bill was barely over $60.00. Definitely an option for weekends since the dining room is pretty large and table turnover is fast. Same comments, different restaurant. Is there anything you actually like??? @C. Diva Not trying to sound too sarcastic, but have you not read any of my previous posts??? I'm sure you'll easily find things I like. @Unknown That's a difficult question as there is no price-range and location. But if I had to choose, the best value/quality is Western Lake.